The Net Price Calculator can give you an estimate of the cost of your education at SWCC and let you compare that cost to 4 year universities. The State Board will consider tuition and mandatory fee increases of between 0 percent and 2.4 percent for all undergraduate students, subject to provisions of the 2019 session of the General Assembly. Buchanan County Residents: Learn about the SWCC Connect Buchanan | Tuition Free College Education scholarship. R.A.C.E. : If you graduated from a Russell County school in 2019, you may qualify for the Russell Co. Access to College Education scholarship. Visit http://www.russell.k12.va.us/race for more information. Community Service hours are required. Filling out the Free Application for Federal Student Aid (FAFSA) is the first step to receiving financial aid through SWCC. 1. If you have applied for Financial Aid (PELL, SEOG, CSAP) and your award has been made, your tuition will be charged to your Financial Aid account, viewable at MYSouthwest>Campus Finances>Account Inquiry. You will receive an award letter from Southwest once your application is complete and award determination is made. 2. If you are a Financial Aid applicant and have not received an award letter, you can verify that your award process has been completed at MYSouthwest>Campus Finances>View Financial Aid. 3. If you are a Financial Aid applicant and your award is not found by viewing your Financial Aid information using item 2 above, contact the Financial Aid office. 4. REMEMBER your financial aid award is based on full time enrollment (12+ credit hours). If you are a part-time student, you should contact financial aid to determine whether your assistance will cover your tuition. The SWCC Educational Foundation, Inc. administers many scholarships for the benefit of SWCC students. A student with a 2.5 (C) GPA or greater is encouraged to apply for scholarships. However, some scholarships do accept lower GPAs, so any student may apply. Based upon application responses, applicants will be matched by the Scholarship Office to scholarships for which they qualify. See scholarship application page. If you filed a late financial aid application or you are not eligible for financial aid, you can apply for an interest-free 60 day short term loan through the Financial Aid office by completing an application and supplying a co-signer who is 21 years of age. Students can apply for low interest student loans through Eastman Credit Union or call 800.999.2328 . Sign up for the TMS Plan to pay tuition due in monthly payments. Find out about important deadlines and how to enroll at the TMS Tuition Payment Plan page. OR mail payment to SWCC Business Office, POB SVCC, Richlands, VA 24641. Make checks and money orders payable to Southwest Virginia Community College. Tuition must be paid in the exact amount due. 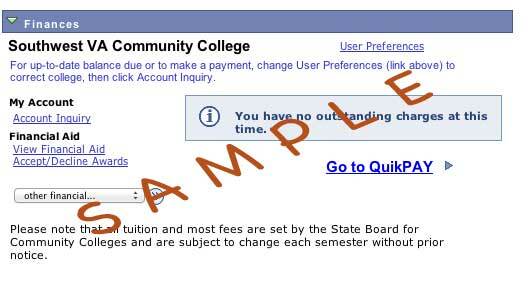 Pay your tuition using Visa, MasterCard, Discover or E-checking by logging into MYSouthwest and using QuikPAY. QuikPAY is a full service eCommerce solution that allows you to make payments to your student accounts online. This service is provided free of charge to you and no signup is necessary. All current students are automatically enrolled in QuikPAY. Contact UsStudents who may have further questions about paying for classes can contact us for more information. Class enrollment at Southwest Virginia Community College is not official until your tuition is paid in full. Tuition becomes due on the first day of class, and is due upon enrollment after the term is underway.